Nandi (Sanskrit: नन्दि, Tamil: நந்தி, Kannada: ನಂದಿ, Telugu: న౦ది, Odia: ନନ୍ଦି) is the gate-guardian deity of Kailasa, the abode of Lord Shiva. He is usually depicted as a bull, which also serves as the mount to Shiva. According to Saivite siddhantic tradition, he is considered as the chief guru of eight disciples of Nandinatha Sampradaya, namely, Sanaka, Sanatana, Sanandana, Sanatkumara, Tirumular, Vyagrapada, Patanjali, and Sivayoga Muni, who were sent in eight different directions, to spread the wisdom of Shaivism. The word Nandi has come from Tamil root word, Nandhu (Tamil: நந்து), which means to grow, to flourish, or to appear, which was used to indicate growing or flourishing of white bulls, as well as divine bull nandi. The Sanskrit word nandi (Sanskrit: नन्दि) has the meaning of happy, joy, and satisfaction, the properties of divine guardian of Shiva- Nandi. Almost all Shiva temples display stone-images of a seated Nandi, generally facing the main shrine. It is recently documented, that the application of the name Nandi to the bull (Sanskrit: Vṛṣabha), is in fact a development of recent syncretism of different regional beliefs within Saivism. The name Nandi was widely used instead for an anthropomorphic door-keeper of Kailasha, rather than his mount, in the oldest Saivite texts in Sanskrit, Tamil, and other Indian languages. Siddhantic texts clearly distinct Nandi from Vṛṣabha. According to them, Devi, Chandesha, Mahakala, Vṛṣabha, Nandi, Ganesha, Bhringi, and Murugan, are the eight Ganeshwaras (commanders) of Shiva. The worship of Shiva and Nandi can even be traced back to the Indus Valley Civilization time-period. The famous 'Pasupati Seal' depicts a seated figure, which is usually identified as Shiva, and there were many bull-seals found in Mohenjo daro and Harappa, which led to conclusion of the researchers, that Nandi worship has been a long standing tradition for many thousands of years. Nandi is described as the son of the sage Shilada. Shilada underwent severe penance to have a boon– a child with immortality and blessings of Lord Shiva, and received Nandi as his son. It is said that Nandi was born from a Yajna performed by the Shilada, and his body was clad in armour made out of diamonds, when he was born. Nandi grew as an ardent devotee of Lord Shiva and he did penance to become his gate-keeper, as well as his mount, on the banks of river Narmada, near Tripur Tirth Kshetra in present-day Nandikeshwar Temple, in Jabalpur, Madhya Pradesh. Nandi got the divine-knowledge of Agamic and Tantric wisdom taught by Shiva, from goddess Parvati. He could teach that divine-knowledge to his eight disciples, who are identified as the progenitors of Nandinatha Sampradaya, namely, Sanaka, Sanatana, Sanandana, Sanatkumara, Tirumular, Vyagrapada, Patanjali, and Sivayoga Muni. These eight disciples were sent in eight different directions of the world by Nandi, to spread this knowledge. Many other puranic tales are available about Nandi. One describes his conflict with Ravana, the anti-hero of Ramayana. 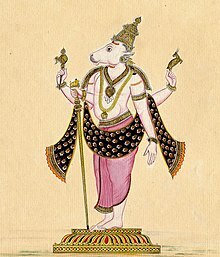 Nandi cursed Ravana (the demon King of Lanka), that his kingdom would be burnt by a monkey (Vanara). Later, Hanuman burned Lanka when he went in search of Sita, who was imprisoned by Ravana in Ashok Vatika. Tamil Thiruvilaiyadal Puranam mentions another story in which Nandi is incarnated as a whale. It says that Parvati lost her concentration while Shiva was explaining the meaning of Vedas to her. Parvati, then incarnated as a fisher-woman to atone. To unite his master and his beloved-wife, Nandi took the form of a whale and started to trouble the people. Fisher-woman Parvati's father told, that one who would kill the whale would marry his daughter. Later, Shiva took the form of a fisherman and killed the whale, and received Parvati in her previous form. Agamas describe him in a zoo-anthropomorphic form, with the head of bull and four hands, with antelope, axe, mace, and abhayamudra. In his mount form, Nandi is depicted as a seated bull in all Shiva temples, all over the world. This form has been found even in Southeast Asian countries including Cambodia. The white color of the bull symbolizes purity and justice. Symbolically, the seated Nandi towards sanctum in Shiva temples, represents an individual jiva (soul) and the message that the jiva should always be focused on the Parameshwara. From the yogic perspective, Nandi is the mind dedicated to Shiva, the absolute. In other words, to understand and absorb light, the experience and the wisdom is Nandi, which is the guru within. Nandi flag or Vrshabha flag, a flag with the emblem of seated bull is recognized as the flag of Saivism, particularly among Tamil community all over the world. Nandi was the emblem of historical Tamil Saivite monarchs, such as Pallava dynasty and Jaffna Kingdom. Several campaigns to aware the Saivites about their Nandi flag is carried out continuously during the Shivaratri session, particularly among Tamil community of Sri Lanka, Tamil Nadu, and diaspora. The nandi flag used nowadays was designed by Ravindra Sastri of Madurai, Tamil Nadu, according to the request and guidance of S. Danapala, a Sri Lankan Saivite personage, in the 1990s. The first Nandi flag was hoisted in 1998, at Colombo Hindu College at Ratmalana, Sri Lanka. Following years, It was declared as the official Saivite flag in fourth International Saiva Siddhanta Conference, held in Zurich in 2008. Nowadays, Tamil Saivites, especially in Sri Lanka, Canada, Australia, UK, South Africa, and Switzerland, hoist the flag in all religious and cultural festivals. Nandi flag was declared as the official Hindu flag of Sri Lanka. ^ Gopinatha Rao, T. A. (1997). Elements of Hindu Iconography, Volume 2. Motilal Banarsidass Publishers. p. 213. ISBN 9788120808775. ^ Tamil Etymological Dictionary Vol.5, Part I. Directorate of Tamil Etymological Dictionary, Government of Tamil Nadu, India. 2005. pp. 153–156. ^ University of Kerala. Dept. of Linguistics (2007). "Nandi". International Journal of Dravidian Linguistics: IJDL. 36: 138. ^ "Monier Williams' Sanskrit-English Dictionary". Retrieved 5 March 2017. ^ Gouriswar Bhattacharya, (1977), "Nandin and Vṛṣabha", Zeitschrift der Deutschen Morgenländischen Gesellschaft, Supplement III,2, XIX. Deutscher Orientalistentag, pp. 1543-1567. ^ Sabaratnam Sivacharyar, Dr.S.P. Shrimat Kamigagamah Purva Pada (Part One). USA: The Himalayan Academy, Kauai Adheenam. pp. 4:471–500. ^ R. C. Dogra, Urmila Dogra (2004). Let's Know Hinduism: The Oldest Religion of Infinite Adaptability and Diversity. Star Publications. ISBN 9788176500562. ^ Chidatman (Swami.) (2009). The sacred scriptures of India, Volume 6. Anmol Publications. p. 79. ISBN 9788126136308. ^ Jayantika Kala (1988). Epic Scenes in Indian Plastic Art. Abhinav Publications. p. 37. ISBN 9788170172284. ^ Indian Association for English Studies (1995). The Indian Journal of English Studies, Volume 34. Orient Longmans. p. 92. ^ "Shiva and Uma on the Bull Nandi". The Walters Art Museum. ^ Vanamali - (2013). Shiva: Stories and Teachings from the Shiva Mahapurana. ISBN 978-1620552490. ^ DBS.Jeyaraj (2013). Reviving Practice of Hoisting 'Nandi' (Crouched Bull) Flag As Hindu Festivals and Functions. ^ a b c Kalabooshanam Chelvathamby Manickavasagar (2008). "Fourth International Saiva Siddhantha Conference and the Glory of Nanthy Flag". The Island. Retrieved 5 March 2017. ^ Rasanayagam, Mudaliyar (1926). Ancient Jaffna, being a research into the History of Jaffna from very early times to the Portuguese Period. Everymans Publishers Ltd, Madras (Reprint by New Delhi, AES in 2003). பக். 390. ISBN 81-206-0210-2. ^ "Hiduism Today, (2008), Hindu Campaigns for Restoration of Nandi Flag Tradition". Retrieved 5 March 2017. ^ a b Taṉapālā, kalāniti., Ciṉṉatturai., (2013), "Nantikkoṭi ēṟṟīr! Koṭikkavi pāṭīr! ", Omlanka Publication. ^ a b Ciṉṉatturai taṉapālā, (2008), "nantikkoṭiyiṉ mukkiyattuvamum perumaikaḷum", Manimekalai Publication. ^ "Nanthi Flag to Maithripala Sirisena". Retrieved 5 March 2017. ^ "Minister Swaminathan urged to Provide Nanthi Flags to Temples, Societies". Retrieved 5 March 2017. 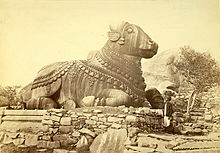 Wikimedia Commons has media related to Nandi.